JAN: May I assume the birds in this photo are swans? I found them in a rye grass field near Halsey . . . Alas, wish I could have got closer; the photo is not very helpful. LARRY: That’s an excellent assumption. They are swans. LARRY: So . . . the question is . . . how did you determine they were Whistling swans and not Trumpeters? Both are found in Oregon. JAN: I just went by what my brother said. I’ll post your challenge comment if you want to write one. LARRY: The Whistler is much more numerous than the Trumpeter so probability is a good argument but your brother left some room for discussion. I was hoping you heard some vocalizations. They do make different sounds and the Whistler is more likely to have yellow on its bill. I don’t see much yellow out there in the photo. Without hearing vocals and without close-up headshots I think an argument can be made for either case. The link I have provided is to some recordings. 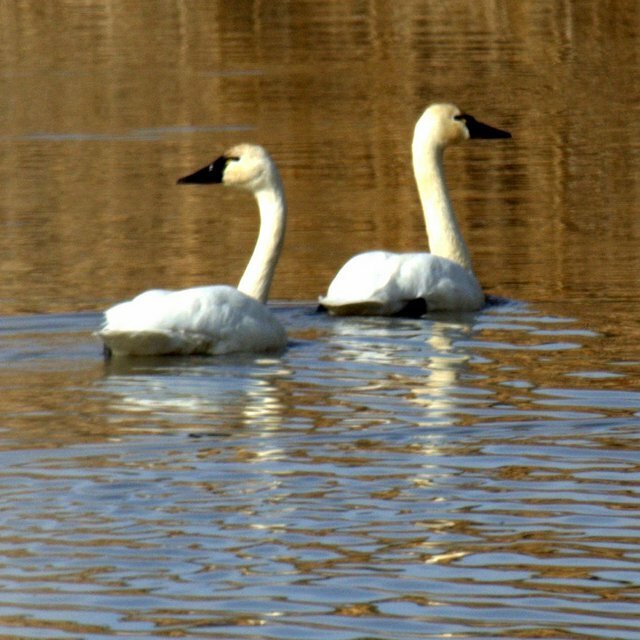 Listen to the swan songs and note the differences in vocalizations. JAN: Thank you for the link. There is a big difference in the vocalizations. It would have been a good clue. The Trumpeters sound like trumpets but I don’t know why the Tundra’s are called “whistlers.” Wish I could have heard these but they were silent or at least I couldn’t hear anything from my position. LARRY: My reference states the Tundra’s were given the name “whistlers” by Meriwether Lewis because of a characteristic whistle from their wings during flight and the name is still used. Whistler’s are very vocal and kept the Lewis and Clark expedition awake at night. They do make quite a din. JAN: Well, I know I didn’t hear the wings whistle and I don’t remember any vocalizations. LARRY: Maybe they were Mute Swans. JAN: Mute Swans . . . that’s good. I will say this, they were huge. They were so big when I first saw them I thought maybe we had a new breed of albino cattle. LARRY: Size is important. Huge leans toward Trumpeter’s; they are almost twice the size of Whistler’s. Ebird reports Whistler’s and Trumpeters in the area. What do they know that we don’t? JAN: A guy turned in where I was parked – our windows were down – I hollered, “what are those”, he hollered back, “Geese”. At least I knew better than that. LARRY: I love it. That’s why I always doubt a report unless I know the person has the ability to make the observation. Here’s a map you can play with. Ebird collects reports from birders and maps their sightings. You can be selective in what you are looking for. There appears to be a significant mix of swans reported by some recognizable experts. Most of the Trumpeter reports are over at the William Finley Refuge. 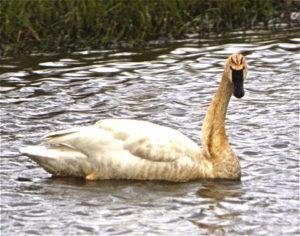 LARRY: We drove down to Halsey today to look for swans – just had to go look for myself. We saw five swans west of Halsey on American Drive. They were too far away to identify. The big flocks have moved on. We drove up to William Finley Refuge and saw another dozen swans. 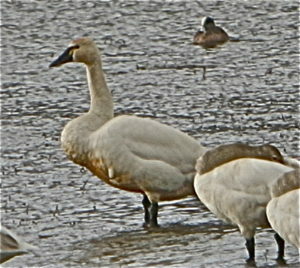 At least one was a Trumpeter swan. It was raining too hard for camera work so I left my camera gear in the car. We got drenched. So, the swan mystery is unresolved. Lacking a definitive photo or swan song I still think a good argument can be made for either case. See Whistling Swans in the Rye Grass Fields for the background.